The Wolff-Kishner reduction is a reaction for converting carbonyls (such as aldehydes or ketones) into alkanes. The deoxygenation reaction is a reduction of a carbonyl group wherein the double bond of carbon-oxygen is converted, for example, to a methylene group. One of these reactions is the Wolff-Kishner reduction. 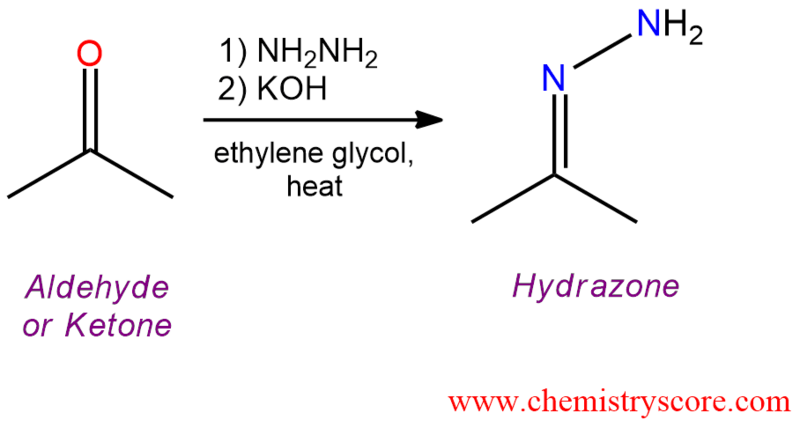 Condensation of hydrazine itself with aldehydes and ketones simple hydrazones which undergo decomposition with evolution of nitrogen when treated with a base at elevated temperatures. The product of this reaction is the corresponding hydrocarbon. In this mechanism, the base (hydroxide) first removes a proton from hydrazone to give the corresponding anion which is stabilized by resonance. This anion is protonated by water and give a neutral azo-intermediate. The base removes another proton from that intermediate to make anion with an excellent leaving group of nitrogen. This anion rapidly decomposes irreversibly because it separates nitrogen as a gas. The result is a strongly basic alkyl anion which is immediately protonated by the aqueous medium to give the final product.